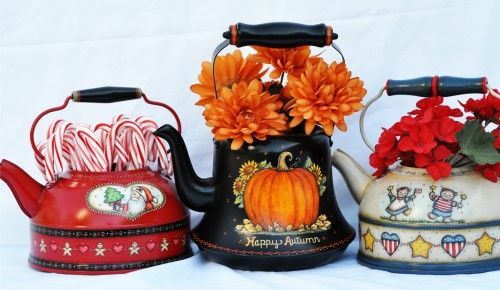 Featuring three teapots, one is for Christmas, one for autumn and one that is patriotic. There are also different designs on the backs of the teapots. These were old teapots that I found at garage sales or flea markets but the designs could be adapted to fit other teapots, buckets or other surfaces. This packet contains: Complete directions, ten color photos and three full size pattern pages.